100% family owned and operated vineyard and winery in the Napa Valley. 100% organically farmed since 1974. 100% estate - single vineyard wines produced. We are celebrating our 41st year of organic farming! 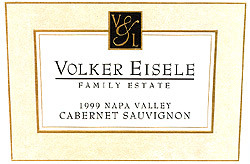 Volker Eisele Family Estate is one of the few vineyards in the Napa Valley that offers a private and comprehensive vineyard tour led by a family member. Tastings are held in our historic winery building that dates back to the late 1800’s. The original structure is a mix of old and new, built from first growth redwood, yet contains a modern temperature controlled tasting room for the optimal experience. We produce three distinct wines, all in the Bordeaux style; Gemini, a blend of Semillon and Sauvignon Blanc, our Cabernet Sauvignon, and Terzetto, a co-fermentation of Cabernet Sauvignon, Cabernet Franc and Merlot. We look forward to welcoming guests to the vineyard by appointment only. View from Tasting Room: Tastings are held in our historic winery building that dates back to the late 1800’s. Vineyard, Walnut and Oak trees surround. Food Available: We offer a small pairing of carefully selected cheeses, nuts and dried fruits to enhance the wine tasting experience. We end the tasting with Terzetto Truffles. Cheers! To join the wine club, visit www.volkereiselefamilyestate.com or call 707-965-9485. Two for one tour and tasting for local residents Monday through Thursday. By appointment only. Please call 707-965-9485 or email info@volkereiselefamilyestate.com to schedule. Cheers! Volker Eisele Family Estate is certified under the Napa Green Winery Program by the Napa County Department of Environmental Management (DEM) and the Association of Bay Area Government’s (ABAG) Green Business Program and completed all the regulatory components needed for environmental sustainability. These components included developing water and energy conservation methods, preventing pollution, and reducing solid waste. In addition to developing sustainable winery practices, this program is set to become the standard for the state of California. Volker Eisele Family Estate is certified under the Napa Green Certified Land Program. Volker Eisele Family Estate has created and implemented a customized farm plan with measured results that addressed all aspects of its property, vineyard land as well as non-farmed land, including practicing soil conservation, water conservation, stable drainage, riparian corridor enhancement, fisheries and wildlife habitat enhancement and long-term improvement and sustainability.